Malvern is a spa town and civil parish in Worcestershire, England. It lies at the foot of the Malvern Hills, a designated Area of Outstanding Natural Beauty. The centre of Malvern, Great Malvern, is a historic conservation area, which grew dramatically in Victorian times due to the natural mineral water springs in the vicinity, including Malvern Water. Welcome to Malvern, on an approach road to the town centre. At the 2011 census it had a population of 29,626. It includes Great Malvern on the steep eastern flank of the Malvern Hills, as well as the former independent urban district of Malvern Link. Many of the major suburbs and settlements that comprise the town are separated by large tracts of open common land and fields, and together with smaller civil parishes adjoining the town's boundaries and the hills, the built up area is often referred to collectively as The Malverns. Archaeological evidence suggests that Bronze Age people had settled in the area around 1000 BC, although it is not known whether these settlements were permanent or temporary. The town itself was founded in the 11th century when Benedictine monks established a priory at the foot of the highest peak of Malvern Hills. :17–24 During the 19th century Malvern developed rapidly from a village to a sprawling conurbation owing to its popularity as a hydrotherapy spa based on its spring waters. :197–198 Immediately following the decline of spa tourism towards the end of the 19th century, the town's focus shifted to education with the establishment of several private boarding schools in former hotels and large villas. A further major expansion was the result of the relocation of the Telecommunications Research Establishment (TRE) to Malvern in 1942. QinetiQ, TRE's successor company, remains the town's largest local employer. Malvern is the largest place in the parliamentary constituency of West Worcestershire and the district of Malvern Hills, being also the district's administrative seat. It lies adjacent to the Malvern Hills Area of Outstanding Natural Beauty. The civil parish is governed by Malvern Town Council from its offices in Great Malvern. The name Malvern is derived from the ancient British or old Welsh moel-bryn, meaning "Bare or Bald Hill", the modern equivalent being the Welsh moelfryn (bald hill). It has been known as Malferna (11th century), Malverne (12th century), and Much Malvern (16–17th century). Flint axes, arrowheads, and flakes found in the area are attributed to early Bronze Age settlers,:2 and the "Shire Ditch", a late Bronze Age boundary earthwork possibly dating from around 1000 BC, was constructed along part of the crest of the hills near the site of later settlements. The Wyche Cutting, a pass through the hills, was in use in prehistoric times as part of the salt route from Droitwich to South Wales. :3 A 19th-century discovery of over two hundred metal money bars suggests that the area had been inhabited by the La Tène people around 250 BC. :5 Ancient folklore has it that the British chieftain Caractacus made his last stand against the Romans at the British Camp, a site of extensive Iron Age earthworks on a summit of the Malvern Hills close to where Malvern was to be later established. The story remains disputed, however, as Roman historian Tacitus implies a site closer to the river Severn. There is therefore no evidence that Roman presence ended the prehistoric settlement at British Camp. However, excavations at nearby Midsummer Hill fort, Bredon Hill, and Croft Ambrey all show evidence of violent destruction around the year 48 AD. This may suggest that the British Camp was abandoned or destroyed around the same time. A study made by Royal Commission in 2005 that includes aerial photographs of the Hills "amply demonstrates the archaeological potential of this largely neglected landscape, and provides food for thought for a number of research projects". A pottery industry based on the Malverns left remains dating from the Late Bronze Age to the Norman Conquest, shown by methods of archaeological petrology. Via the River Severn, products were traded as far as South Wales, . The Longdon and other marshes at the foot of Malvern Chase were grazed by cattle. "Woodland management was considerable", providing fuel for the kilns. Little is known about Malvern over the next thousand years until it is described as "an hermitage, or some kind of religious house, for seculars, before the conquest, endowed by the gift of Edward the Confessor". :14 The additions to William Dugdale's Monasticon include an extract from the Pleas taken before the King at York in 1387, stating that there was a congregation of hermits at Malvern "some time before the conquest". Although a Malvern priory existed before the Norman Conquest, it is the settlement of nearby Little Malvern, the site of another, smaller priory, that is mentioned in the Domesday Book. A motte-and-bailey castle built on the top tier of the earthworks of the British Camp just before the Norman Conquest was probably founded by the Saxon Earl Harold Godwinson of Hereford. It was destroyed by King Henry II in 1155. The town developed around its 11th-century priory, a Benedictine monastery, of which only the large parish church and the abbey gateway remain. Several slightly different histories explain the actual founding of the religious community. Legend tells that the settlement began following the murder of St. Werstan, a monk of Deerhurst, who fled from the Danes and took refuge in the woods of Malvern, where the hermitage had been established. :11 St Werstan's oratory is thought to have been on the site of St Michael's Chapel, which is believed to have stood on the site of Bello Sguardo, a Victorian Villa, which was built on the site of Hermitage Cottage. The cottage was demolished in 1825 and ecclesiastical carvings were found in it, along with a mediaeval undercroft, human bones, and parts of a coffin. Although the legend may be monastic mythology, historians have however concluded that St. Werstan was the original martyr. The first prior, Aldwyn, founded the monastery on his bishop's advice, and by 1135 the monastery included thirty monks. Aldwyn was succeeded by Walcher of Malvern, an astronomer and philosopher from Lorraine in France, whose gravestone inside the priory church records details that the priory arose in 1085 from a hermitage endowed by Edward the Confessor. An ancient stained glass window in the Priory church depicts the legend of St. Werstan, with details of his vision, the consecration of his chapel, Edward the Confessor granting the charter for the site, and Werstan's martyrdom. An 18th-century document states that in the 18th year of the reign of William the Conqueror (probably 1083), a priory was dedicated to St Mary the Virgin. Victoria County History describes how a hermit Aldwyn, who lived in the reign of Edward the Confessor, had petitioned the Earl of Gloucester for the original site (of the Priory) in the wood, and cites his source as "Gervase of Canterbury, Mappa Mundi (Rolls ser.)". Large estates in Malvern were part of crown lands given to Gilbert "the Red", the seventh Earl of Gloucester and sixth Earl of Hertford, on his marriage to Joan of Acre the daughter of Edward I, in 1290. Disputed hunting rights on these led to several armed conflicts with Humphrey de Bohun, 3rd Earl of Hereford that Edward resolved. Nott states that Gilbert made gifts to the Priory, and describes his "great conflict" with Thomas de Cantilupe, Bishop of Hereford, also about hunting rights and a ditch that Gilbert dug, that was settled by costly litigation. Gilbert had a similar conflict with Godfrey Giffard, Bishop and Administrator of Worcester Cathedral (and formerly Chancellor of England). Godfrey, who had granted land to the Priory,:52 had jurisdictional disputes about Malvern Priory, resolved by Robert Burnell, the current Chancellor. A discussion in 2005 about the stained glass windows of the Priory Church in terms of the relationship between Church and Laity stresses the importance of Malvern in the development of stained glass. It refers to "the vast and strategically important estates of which Malvern was a part" in the 15th and 16th centuries, to a widespread awareness of Malvern Priory, to the likelihood of a pilgrimage route through the town. The discussion also mentions Thomas Walsingham's view that Malvern was a hiding place of the Lollard knight Sir John Oldcastle in 1414. Chambers wrote, in relation to the stained glass, "the situation of Malvern was so much admired by Henry VII, his Queen (Elizabeth of York) and their two Sons, Prince Arthur, and Prince Henry" that they made substantial endowments. As a Royal forest, the area and the surrounding chase were subject to forest law. By Tudor times, royal lands had become used as commons and forest law had fallen into disuse. During the Dissolution of the Monasteries the local commissioners were instructed to ensure that abbey churches used for parish worship, should continue or could be purchased by parishioners. Malvern Priory was thus acquired by a William Pinnocke and with it, much of the 15th century stained glass windows. The monastic buildings were taken apart and anything usable was sold off. With the exception of the church building (of which the south transept adjoining the monastery's cloisters was destroyed), all that remains of Malvern's monastery is the Abbey Gateway (also known as the Priory Gatehouse) that houses today's Malvern Museum. An Elizabethan land grant of 1558 mentions Holy Well. A Crown grant of tithes in 1589 mentions lambs, pigs, calves, eggs, hemp and flax. Elizabeth made her Chancellor, Sir Thomas Bromley, the Lord of the Manor. The contemporary antiquary John Leland described the Malvern Hills and Hanley Castle. King Charles I attempted to enclose and sell two thirds of the Chase, as part of a wider attempt to raise revenue for the Crown from the sale of Royal forests. The attempts to enclose the lands, used as commons, resulted in riots, part of a pattern of disturbances that ran across the disafforested royal lands. In 1633, the Court of Exchequer Chamber of Charles I decreed the rights of the public to two thirds of the lands on the Malvern Hills, and rights of Sir Cornelius Vermuyden and his descendants, and the Crown, to one third (quoted in the preamble to the Malvern Hills Act of 1884). By that time, Malvern had become an established community and the major settlement in the Malvern Chase. The purported health-giving properties of Malvern water and the natural beauty of the surroundings led to the development of Malvern as a spa, with resources for invalids for tourists. :197 According to legend, the curative benefit of the spring water was known in mediaeval times. The medicinal value and the bottling of Malvern water are mentioned "in a poem attributed to the Reverend Edmund Rea, who became Vicar of Great Malvern in 1612". The occulist Richard Banister wrote about the Eye Well, close to the Holy Well, in a short poem in his Breviary of the Eyes (see Malvern water), in 1622. In 1756, Dr. John Wall published a 14-page pamphlet on the benefits of Malvern water, that reached a 158-page 3rd edition in 1763. Further praise came from the botanist Benjamin Stillingfleet in 1757, the poet Thomas Warton in 1790, and William Addison, the physician of the Duchess of Kent (mother of Queen Victoria) in 1828, all quoted in a review by the medical historian W.H. McMenemy. In his lecture about Malvern at the Royal Institution, Addison spoke of "its pure and invigorating air, the excellence of its water, and the romantic beauty of its scenery". Similar views appeared in the press, Nicholas Vansittart brought his wife Catherine to Malvern for a rest cure in 1809. Chambers, in his book about Malvern, praised Elizabeth, Countess Harcourt (daughter-in-law of the 1st Earl Harcourt), whose patronage contributed to the development of hillside walks. Queen Adelaide visited St. Ann's Well in September 1842.:183 "Throughout the 1840s and 1850s Malvern attracted a stream of celebrated visitors, including royalty." Patients included Charles Darwin, Catherine, wife of Charles Dickens,  Thomas Carlyle, Florence Nightingale, Lord Lytton, who was an outspoken advocate of the waters, Lord Tennyson and Samuel Wilberforce. The 1887 Baedeker's includes Malvern in a London–Worcester–Hereford itinerary and described as "an inland health resort, famous for its bracing air and pleasant situation" and "a great educational centre", with five hotels that are "well spoken of", a commercial hotel, the Assembly Rooms and Gardens, and many excursions on foot, pony and by carriage. Other descriptions of the diversions mention bands, quadrilles, cricket (residents vs visitors) and billiard rooms. :197 The Duchess of Teck stayed, with her daughter Mary (later queen consort of George V), in Malvern in the Autumn of 1891, joined by Lady Eva Greville. and the Duke of Teck. The Duchess was "perfectly enchanted with Malvern and its surroundings" and, with the Duke, visited Malvern College. The Duchess returned to open the new waterworks at Camp Hill in 1895. In 1897, the painter Edward Burne-Jones came to Malvern for the "bracing air", on the recommendation of his doctor, but stayed in his hotel for a week. The 7-year old Franklin D. Roosevelt visited in 1889, during a trip to Europe with his parents. Towards the end of the 19th century, the popularity of the hydrotherapy had declined to the extent that many hotels were already being converted into private boarding schools and rest homes, and education became the basis of Malvern's economy. :195 By 1865, the town already had 17 single-gender private schools, increasing to 25 by 1885. The area was well suited for schools due to its established attractive environment and access by rail. Children could travel unaccompanied with their trunks by rail to their boarding schools near the stations in Great Malvern, Malvern Wells, and Malvern Link. Malvern St James (formerly Malvern Girls College), in a former hotel, opposite Great Malvern railway station, has a tunnel (now derelict) to the basement of the building, which is visible from both platforms of the station. Council House (built 1874), viewed from Priory Park, is the headquarters of the District Council. Malvern is a town and civil parish governed at the lowest tier of local government by Malvern Town Council, part of the Malvern Hills District of the County of Worcestershire (a district comprising 68 civil parishes and 22 electoral wards). The ward boundaries were redefined from the wards of the former Malvern Urban District Council (1900–1974). Through the many changes in local government infrastructure since the beginning of the 20th century, the importance and distinction by local boundaries of the historical areas of Great Malvern, Malvern Link, North Malvern, Cowleigh, and other neighbourhoods, have been lost. The original parish of Great Malvern included the hamlet of Guarlford and the chapelry of Newland, and stretched from the River Severn on the east to the Malvern Hills on the west. Guarlford became a separate civil parish in 1894 when, under the Local Government Act of 1894, urban district councils were created for Malvern and Malvern Link. The Guarlford parish covered much of eastern Malvern, including parts of Great Malvern, Pickersleigh, Poolbrook, Barnards Green, Hall Green and Sherrard's Green. By 1900 however, the urban districts of Malvern and Malvern Link amalgamated, absorbing parts of neighbouring parishes to create a town of six wards under the Malvern Urban District Council. :197 In 1934 the boundaries changed again, and those areas came under the control of the Malvern council. Chase — named after Malvern Chase — covering much of Barnards Green, the extensive Ministry of Defence property occupied by QinetiQ, the campus of The Chase School, the village of Poolbrook, and the largely rural south-eastern area of the adjoining Poolbrook and Malvern commons. Dyson Perrins, the northern part of Malvern adjacent to Link with the campus of Dyson Perrins School and the former MoD DERA North Site, and the former hamlets of Interfield, Halfkey, and Upper Howsell; this ward includes a new neighbourhood of the town — Malvern Vale. Link, that covers most of the area north of the Link Common between Link Top and Newland, and Upper and Lower Howsell. North Malvern, an area between Link Top and West Malvern civil parish that includes the former village of Cowleigh. Pickersleigh, that includes the part of the former Great Malvern boundaries east of the railway between Barnards Green and Malvern Link to Madresfield, the former hamlets of Hall Green and Sherrards Green, and part of Barnards Green. Priory, covering much of Great Malvern, including all the town centre, and otherwise areas west of the railway between North Malvern and Malvern Wells civil parish. The town centre comprises two main streets at right angles to each other: the steep Church Street and Bellevue Terrace, a relatively flat north–south extension of the A449 which forms Malvern's western extremity along the flank of the hills. Among the many shops are two large modern supermarkets, both in Edith Walk, formerly a steep and unmade lane that served the rear entrances of the shops in Church Street. Many of the traditional high street shops such as butchers, bakers, grocers etc., are now health food shops, art and craft shops, charity shops, law firms, and estate agents. The offices of Malvern Town Council, the Malvern Hills Conservators, The Malvern Hills AONB Partnership, and Malvern Hills District Council are in the town centre. The town's amenities include the Malvern Theatres complex, the Priory Park, the Splash leisure and swimming complex, the main library, the police station, the tourist information centre, and the museum. In the heart of the town is a statue of the composer Edward Elgar, while other statuary is dedicated to Malvern water. Great Malvern station, a listed example of classical Victorian railway architecture, is close to the nearby former Imperial Hotel by the same architect, E. W. Elmslie. Malvern's rapid urbanisation during the latter half of the 19th century spread eastwards and northwards from Great Malvern, the traditional town centre on the steep flank of the Worcestershire Beacon, and engulfed the manors and farms in the immediate area. It was often the farms, such as Pickersleigh (now known as Pickersleigh Court and previously known as Pickersleigh House), near Great Malvern, and the Howsells in Malvern Link which merged with Great Malvern in 1900 that gave their names to many of the new neighbourhoods. The urban agglomeration continued to spread, and by the middle of the 20th century had reached the suburban parishes of West Malvern, Malvern Wells, Newland, Madresfield, and Guarlford. Malvern lies in the Lower Severn/Avon plain affording it a degree of shelter caused by virtue of its nestling in between the Cotswold hills to the east, the Welsh Hills and Mountains to the west, and Birmingham plateau to the north. Although as with all the British Isles it has a maritime climate, the local topography means summer warmth can become emphasised by a slight foehn effect off the surrounding hills. The record maximum stands at 35.8c(96.4f) set in August 1990. Typically 17.3 days of the year will reach 25.1c(77.2f) or higher and the annual warmest day should reach 29.8c(85.6f) according to the 1971–00 observing period. Winter temperature inversions can also occur given the correct conditions allowing very low minima to occur. Nonetheless, on average the region is one of the warmest non-coastal areas in the UK, with overall night time minima in particular rivalling more urban areas. Indeed, despite the notable low absolute minima (several weather-observing sites nearby having fallen below −20 °C in the past) the annual average frost ratio is a mere 33 days per year (1971–00), actually lower than more urbanised weather station locations such as London's Heathrow Airport. A new absolute minimum of −19.5 °C (−3.1 °F) was recently set during the record cold month December 2010. Prior to this the coldest nights were recorded in the winter of 1981/82; -18.1 °C (−0.6 °F) in December 1981, −18.0 °C (−0.4 °F) in January 1982. The sunniest year was 2003, when 1776 hours of sunshine were recorded. Rainfall averages around 740mm per year with over 1mm being recorded on 123 days of the year. Snowfall is highly variable. When winter low pressure systems move from south west to north east the Malvern area is often on the northern flank, meaning heavy snowfall while areas further south and east receive rain or no precipitation at all. However, when snowfall arrives by means of convective showers driven by northerly, north westerly or north easterly winds the area tends to be one of the least snowy parts of the UK, owing to its sheltered positioning. At the 2011 UK census, the civil parish of Malvern had a population of 29,626. Together with the neighbouring parishes of West Malvern, Malvern Wells, Little Malvern and Newland (the settlements of which largely unite with that of Malvern) the population of the wider "Malverns" urban area is 34,517 (as of 2011). For the purposes of statistical reporting the Office for National Statistics groups the population of the North Malvern ward of the Malvern civil parish with that of the West Malvern civil parish. For every 100 females, there were 91.7 males. The average household size was 2.4. Of those aged 16–74 in Malvern, 48.1% had no academic qualifications or one General Certificate of Secondary Education (GCSE), above the figures for all of the Malvern Hills local government district (39.7%) and England (45.5%). According to the census, 2.3% were unemployed and 35.0% were economically inactive. 19.7% of the population were under the age of 16 and 11.5% were aged 75 and over; the mean age of the people of the civil parish was 41.5. 66.8% of residents described their health as "good", similar to the average of 69.1% for the wider district. The 2011 census found the White British ethnic group to be by far the largest in Malvern with 93.2% identifying as such. The next largest ethnic group was White Other, which accounted for 3.2% of the population, followed by the Asian and Mixed Race categories, which made up 1.9% and 1.2% respectively. Black ethnic groups made up 0.3% and the Other group constituted 0.2% of the population. The area remained a village and cluster of manors and farms until "taking of the water" in Malvern became popularised by Dr. Wall in 1756. By the 1820s the Baths and the Pump Room were opened; in 1842 Drs. James Wilson and James Manby Gully opened up water cure establishments in the town centre. By the middle of the 19th century, with the arrival of the railway, bath houses and other establishments catering for the health tourists flourished. By the early 20th century Malvern had developed from a small village centred on its priory to a town with many large hotels and Victorian and Edwardian country villas. Malvern's population grew in 1942 when the Telecommunications Research Establishment (TRE) moved to Malvern, bringing 2,500 employees, increasing to around 3,500 by 1945.:259, 260 In the early 1950s, several large housing estates were built in Malvern by the government to provide accommodation for the staff and their families. A significant proportion of the current population of Malvern are present and former employees of the facility (now called QinetiQ), and its previously attached military contingent from REME and other units of all three British armed forces. Malvern had already become an overspill for the nearby city of Worcester, and the new motorways constructed in the early 1960s brought the industrial Midlands within commuting distance by car. With this development came the construction of large private housing developments. The town continues to swell as increasingly more farmland, especially in the Malvern Link area between the villages of Guarlford and Newland, is turned over to housing projects creating new communities and suburbs. Due to frequent merging of parishes and changes in boundaries, accurate figures based on specific areas are not available. 1563 105 families Probably what is now the town centre area with nearby farms and manors. 1741 had sixty houses Probably what is now the town centre area. 1819 2,768 1819 census – probably what is now the town centre area (Great Malvern). 1851 3,771 Probably including the former ecclesiastical parishes of Guarlford and Newland, and the settlement of Poolbrook. 2001 28,749 Includes the six wards covered by the current Town Council civil parish. 2011 29,626 Same area as in 2001. Since 1942 research and development into defence physics and electronics has been the major source of employment in Malvern when during World War II the Telecommunications Research Establishment (TRE) moved from Worth Matravers on the south coast for safety from enemy action. The Radar Research and Development Establishment (RRDE) was moved to Malvern at the same time. Initially, TRE was housed at Malvern College. TRE and RRDE merged in 1953 to form the Radar Research Establishment (RRE) to be further renamed Royal Radar Establishment (also RRE) in 1955.:258 In 2001 when the facility was partly transferred from public to private ownership and became QinetiQ. The Dstl, the Defence Science and Technology Laboratory has since closed down with the remaining staff moving to other Dstl sites. With the recognised science and technology developments in the Malvern area, Malvern Hills Science Park was built in 1999, and is now home to over 30 science and technological businesses, including, UTC Aerospace Systems (formerly Goodrich Corporation), and Textlocal. Other manufacturing and service industries are mainly grouped in the Spring Lane Industrial Estate that was developed in the 1960s and the adjoining Enigma Business Park that was begun in the 1990s. Cars have been constructed in Malvern since 1894 by Santler (Britains first petrol car) and 1910 by the Morgan Motor Company, one of the world's longest-existing private constructors of automobiles produced in series. The Morgan Motor Car is a traditional sports roadster and over the years has become a 'cult' vehicle, exported all over the world from the factory in Malvern Link. Specialist glass tubing and microscope slides are produced by Chance Brothers in their factory in Malvern next door to the Morgan Motor works. Pipe organs have been built in Malvern since 1841 by Nicholson Organs. Nicholson organs can be found in Gloucester and Portsmouth Cathedrals, and Great Malvern Priory. Malvern is a centre for agricultural industry. The 70-acre (280,000 m2) Three Counties Showground, operated by the Three Counties Agricultural Society, is a few miles to the south of Malvern on the road to Upton upon Severn. It has been the permanent venue for the Royal Three Counties Show, held each year in June, since 1958. Representing the counties of Worcestershire, Herefordshire and Gloucestershire, it is one of the most important agricultural shows in the UK, and can be traced back to 1797. It attracts an average of 93,000 visitors over its three-day event, and the event almost doubles the town's local population. The showground also hosts the Royal Horticultural Society's Spring Gardening Show, followed by many other events throughout the year including other regular gardening shows. The Lobelia pioneers William Crump and Dr. Brent Elliott worked in Malvern and were awarded the Victoria Medal of Honour of the Royal Horticultural Society. A tea rose was named for the Malvern rose grower Mrs. Foley Hobbs in 1910 (see page 119 of cited work). The town centre and its environs contain many examples of Regency, Victorian and Edwardian villas and hotels. Many of the houses were built during the Industrial Revolution and Malvern's boom years as a spa town by wealthy families from the nearby Birmingham area. Following the collapse of the spa industry, many of the hotels and villas became schools, and some have since been further converted to apartments, while some of the smaller hotels are now retirement homes. The Imperial Hotel in red brick with stone dressings, which later became a school, is one of the largest buildings in Malvern. It was built in 1860 by the architect E. W. Elmslie who also designed the Great Malvern railway station, and the Council House on the plot where Dr. Gully's original house stood. The Grove in Avenue Road in 1867, originally to be his private residence in 1927 became part of the Lawnside School for girls, and in 1860 Whitbourne Hall, a Grade II* listed building, in Herefordshire. The Imperial was the first hotel to be lit by incandescent gas. It was equipped with all types of baths and brine was brought specially by rail from Droitwich. Sir Edward Elgar, British composer and Master of the King's Musick, lived much of his life around Malvern. His Pomp and Circumstance, March No. 1, composed in 1901 and to which the words of Land of Hope and Glory were later set, was first performed in the Wyche School next to the church in the presence of Elgar. A sculpture group by artist Rose Garrard comprising the Enigma fountain together with a statue of Elgar gazing over Great Malvern stands on Belle Vue Terrace in the town centre. The Elgar Route, a 40-mile (64 km) drive passing some key landmarks from Elgar's life, passes through Malvern. Malvern Concert Club, founded in 1903 by Elgar, holds concerts held in the Forum Theatre, Malvern Theatres. Its programmes focus on renaissance, baroque, classical, romantic and contemporary music. The Chandos Symphony Orchestra, under the professional direction of Michael Lloyd, has over 100 players. It specialises in performances of major works of the 19th and 20th Centuries. The Autumn in Malvern Festival is an annual event featuring performances of artists of music, poetry, writers and film makers held during October every year. The Colwell and other brass bands of the early century were part of the music of the town. The British violinist Nigel Kennedy lived in Malvern for many years and gives concerts in the town's culture venue. Julius Harrison (1885–1963), lived in Pickersleigh Road for most of the 1940s and was music director at Malvern College and director of the early Elgar Festivals in Malvern. In the 1960s, 1970s and 1980s, the Malvern Winter Gardens was a major regional venue for concerts by popular rock bands, including The Rolling Stones, Dave Berry, T-Rex, The Jam, AC/DC, Black Sabbath, The Undertones, and Joy Division. Many of the 1960s concerts were staged by Bannister promotions while later events were promoted by Cherry Red, a London-based independent record label formed in 1978. Malvern Theatres, housed in the Winter Gardens complex in the town centre, is a provincial centre for the arts. The first Malvern Drama Festival, which took place in 1929, was dedicated to Bernard Shaw and planned by Sir Barry Jackson. A number of works have had their first performances at Malvern, six by Shaw including In Good King Charles's Golden Days, the 1929 English première of The Apple Cart,:255 and the world première of Geneva in 1938. In 1956 Malvern held a Shaw centenary week. In February 1965 a Malvern Festival Theatre Trust was set up, and extensive refurbishment was undertaken. J B Priestley presided over the opening ceremony of the first summer season. In 1998, a further £7.2 million major redesign and refurbishment took place with the help of contributions from the National Lottery Distribution Fund (NLDF), administered by the government Department for Culture, Media and Sport. The Theatre of Small Convenience entered the Guinness Book of World Records in 2002 as the smallest theatre in the world. Housed in a former Victorian public convenience in the centre of the town in Edith Walk, the theatre had a capacity of 12 people. Before closing, in 2017, theatre regularly hosted puppetry, professional and amateur actors, drama, poetry, storytelling, and opera. William Langland's famous 14th-century poem The Visions of Piers Plowman (1362) was inspired by the Malvern Hills and the earliest poetic allusion to them occurs in the poem And on a Maye mornynge on Malverne hylles. Langland, the reputed writer, was possibly educated at the priory of Great Malvern. Several roads and buildings in Malvern are named after him. Lord Macaulay: "Till twelve fair counties saw the blaze on Malvern's lonely height" (The Armada). C. S. Lewis and J. R. R. Tolkien are among the authors that have frequented Malvern. Legend states that, after drinking in a Malvern pub one winter evening, they were walking home when it started to snow. They saw a lamp post shining out through the snow and Lewis turned to his friends and said "that would make a very nice opening line to a book". The novel The Lion, the Witch and the Wardrobe by Lewis later used that image as the characters enter the realm of Narnia.J.R.R. Tolkien found inspiration in the Malvern landscape which he had viewed from his childhood home in Birmingham and his brother Hilary's home near Evesham. He was introduced to the area by C. S. Lewis, who had brought him here to meet George Sayer, the Head of English at Malvern College. Sayer had been a student of Lewis, and became his biographer, and together with them Tolkien would walk the Malvern Hills. Recordings of Tolkien reading excerpts from The Hobbit and The Lord of the Rings were made in Malvern in 1952, at the home of George Sayer. The recordings were later issued on long-playing gramophone records. In the liner notes for J.R.R Tolkien Reads and Sings his The Hobbit & The Fellowship of the Rings, George Sayer wrote that Tolkien would relive the book as they walked and compared parts of the Malvern Hills to the White Mountains of Gondor. The poet W. H. Auden taught for three years in the 1930s at The Downs School, in the Malvern Hills. He wrote many poems there, including: This Lunar Beauty; Let Your Sleeping Head; My Love, Fish in the Unruffled Lakes; and Out on the Lawn I Lie in Bed. He also wrote the long poem about the hills and their views, called simply The Malverns. In his 1941 novel Mr Lucton's Freedom Halesowen-born novelist Francis Brett Young describes sleeping out on the Malvern Hills and seeing the sunrise over the town. Works of art in Malvern include fountains, statues, and Malvern water spouts by the sculptor Rose Garrard. Among her sculptures are the statue of Sir Edward Elgar and the Enigma Fountain (Unveiled by Prince Andrew, Duke of York on Belle Vue Terrace, Malvern on 26 May 2000). and the drinking spout, Malvhina, also on Belle Vue Terrace, which was unveiled on 4 September 1998. The Malvinha Fountain in the town centre, a sculpture by artist Rose Garrard. Garrard's Hand of Peace war memorial, a sculpture in Portland stone is in the Barnards Green suburb of Malvern. Paintings of Malvern include Little Malvern Church by Joseph Farington now held by the Royal Academy, and a squared drawing by the art historian Robert Witt in the collection of the Courtauld Institute, Joseph Powell's Great Malvern Priory ... from the North East (1797), now in the British Watercolours collection of the Victoria and Albert Museum. David Prentice, artist and one of the founder members of Birmingham's Ikon Gallery, has lived and worked in Malvern since 1990. He started painting the Malvern Hills when he retired in 1983. A sculpture of two buzzards by Walenty Pytel was installed in Rosebank Gardens, Great Malvern to commemorate the Queen's Diamond Jubilee in November 2012. Elgar, a drama documentary made in 1962 by the British director Ken Russell, was filmed on location in Malvern and Worcester. Several scenes were filmed in Malvern at locations including 'Forli' in Alexandra Road, 'Craeg Lea' in Malvern Wells and St Ann's Well in Great Malvern. Made for BBC Television's long-running Monitor programme, it dramatised the life of the composer Edward Elgar. The film significantly raised the public profile of the composer. The Malvern landscape forms the backdrop for Penda's Fen, a 1974 British television play written by David Rudkin and directed by Alan Clarke for the BBC's Play for Today series. It tells the story of Stephen, a vicar's son who has visions of angels, Edward Elgar, and King Penda, the last pagan ruler of England. 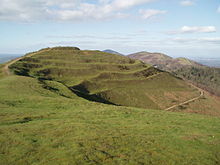 The final scene of the play, where the protagonist has an apparitional experience of King Penda and the "mother and father of England" and King Penda, is set on the Malvern Hills. Great Malvern railway station featured in 1975 as the commuter-belt railway station in the first episode of Survivors (1975 TV series), the post-apocalyptic fiction drama television series created by Terry Nation and produced by Terence Dudley at the BBC. Malvern spring water flows freely from a number of fountains or spouts throughout the Malvern area. Upkeep of these historical springs is funded by several organisations, including the Town Council, the Heritage Lottery Fund, The Malvern Spa Association, and the Area of Outstanding Natural Beauty. The water became famous for containing "nothing at all". It was the reason for Malvern becoming a spa town and has formed a part of both local and national culture since Queen Elizabeth I made a point of drinking it in public in the 16th century, and Queen Victoria refused to travel without it. It is also a bottled water used by Queen Elizabeth II Until November 2010 when the plant was closed due to lack of profitability, millions of litres of Malvern water were bottled annually by Coca-Cola Enterprises under the Schweppes brand in a factory near Malvern and distributed worldwide. Malvern water is still being bottled from the original source by a family run business under the name Holywell Spring Water. Malvern has since 2013 been twinned with Mariánské Lázně, a spa town in the Czech Republic, and since 2016 also with Bagnères-de-Bigorre, a spa town in France. In addition to the 12th century priory, during and shortly after Malvern's expansion throughout the second half of the 19th century over twenty Christian churches were built. Many of these are reproductions of 13th and 14th century architecture including Church of St Matthias, Malvern Link (C of E) begun in 1843, which has a full set of ten ringing bells on which the first full peal of Grandsire Triples was rung on 1 June 1901. One of the most recent buildings is St Mary's Church (C of E), in Sherrards Green, a modern church built c1960. Major health facilities are provided by hospitals in Worcester. The town has seven health centres, including a health complex in Malvern Link and a group practice on Pickersleigh Road. Malvern also has several nursing and retirement homes for the care of senior citizens. The Malvern area is covered by the Midlands Air Ambulance service, which has operated from the site of Strensham motorway services since 1991. Malvern is served by the West Midlands Ambulance Service operated by the NHS Trust. The ambulance station is in Victoria Road, Great Malvern, near the town centre. Other emergency services are provided by West Mercia Police from a station in Victoria Road, and the Hereford and Worcester Fire and Rescue Service that has a station in Worcester Road, Malvern Link. Major road access to the area is provided by the A449 road that runs through the centre of Malvern, connecting it to Worcester and Ledbury. The M5 motorway (West Bromwich near Birmingham to Exeter in Devon) is accessible at junctions 7 and 8 to the east of Malvern. The M50 motorway (Tewkesbury to Ross-on-Wye), also known as the Ross Spur to the south is accessed at junction 1 on the A38 road between Tewkesbury and Malvern. Two railway stations approximately one mile (1.6 km) apart at Great Malvern and Malvern Link. Great Western Railway and West Midlands Trains operate services as far as Hereford, Birmingham New Street, Brighton and London Paddington. Malvern bus services include several circular urban routes connecting the main residential and commercial areas and out-of-town shopping malls. Other routes serve the surrounding villages, towns and cities, while long-distance direct bus services connect Malvern with other cities in the country. Operators include Diamond Bus and First Midland Red. Air services operate from Birmingham Airport, about an hour's drive away on the M5 and M42 motorways. Gloucestershire Airport, at Staverton, in the borough of Tewkesbury, is a busy general aviation airport, used mainly for private charter and scheduled flights to such destinations as the islands of Jersey and Guernsey and the Isle of Man, for pilot training, and by the aircraft of emergency services. Taxi services are provided by numerous local firms. Elementary education is provided by thirteen primary schools in the town and its suburbs including eight Church of England, one Roman Catholic, and four non-denominational state schools. With the exception of The Grove (1962), Poolbrook Primary School (1977), and Northleigh (1991) that replaced the Cowleigh C of E school destroyed by arson in 1989, all the Malvern primary schools were established between 1836 and 1916, during and shortly after the town's rapid development as a spa. The Chase School in Barnards Green is a secondary school with around 1300 pupils. It is a specialist Technology, Language and Science college under the specialist schools programme, previously designated a Beacon School. Dyson Perrins Church of England Academy in Malvern Link, a Church of England school with almost 1000 pupils, is a specialist Sports College. Hanley Castle High School, with around 1000 pupils, including its sixth form centre, is a specialist Language College and was founded in 1326 as a chantry school, making it one of the oldest schools in England. Although the school is in the village of Hanley Castle, about 4 miles (6.4 km) from the town, many of its pupils come from the Malvern area. Two large independent 'public' schools – Malvern College for boys and girls and Malvern St James for girls – now remain following mergers of Malvern's many private primary and secondary schools. Malvern College is a coeducational public school, founded in 1865. Until 1992, it was a school for boys aged 13 to 18. Following a merger with Ellerslie School for Girls in 1992 it became coeducational. Among its alumni are two Nobel Laureates (James Meade and Francis William Aston), an Olympic Gold medalist (Arnold Jackson), and leading politicians. Further acquisition of Hillstone and merger with The Downs (in nearby Colwall) preparatory schools has established an independently-run coeducational feeder school, The Downs Malvern, for pupils up to 13 years old. Malvern St James was formed in 2006 by the merger of Malvern Girls' College and St. James's School, West Malvern (formerly St James's and The Abbey) and other mergers with local private schools over the last thirty years. It is now the last of the independent girls' schools in the Malvern area. The main building of Malvern St James on the campus of the former Malvern Girls' College is the former Imperial Hotel, built in the second half of the 19th century. Hatley St James, a Victorian mansion on Albert Road South, and former residence of the Seton-Karr family, was used as a house for the school. The Abbey College is an international boarding school providing education mainly for students from countries outside the United Kingdom. Founded in 1974, it provides pre university preparation for mixed gender students aged 14 to 20. Malvern Hills College is a centre for further education providing government certificate vocational courses for adults and post 14-year-old students. Malvern also has an active University of the Third Age that was founded at Malvern Hills College in 1995. Its inaugural meeting was attended by around 150 members of the public, and by 2011 it had over 80 interest groups and 1,100 members. The Priory Park with its adjoining Malvern Splash pool and Winter Gardens complex occupies a large area in the centre of the town. The Winter Gardens complex is home to the Malvern Theatres, a cinema, a concert venue/banqueting room, bars and cafeterias. For almost half a century, the Malvern Winter Gardens has also been a leisure centre and a major regional venue for classical music, and concerts by major rock bands of the 60s, 70s and 80s. The Splash Leisure Complex flanks the eastern boundary of Priory Park and has an indoor swimming pool and gymnasium. In the town centre is also an extensive public Library that includes access to the Internet and many community services. The Worcestershire Way, a waymarked long-distance trail in Worcestershire, runs 31 miles (50 km) from Bewdley to Great Malvern. The Manor Park Club multi-sports complex, close to the town centre, provides the area with indoor and outdoor sports facilities including tennis, squash, indoor bowls, racketball, archery and table tennis. It is assisted by grants from various bodies, including the Malvern Hills District Council, the Sport England Lottery, and the Lawn Tennis Association. In 2010, a new indoor facility was unveiled at the club by tennis player Tim Henman. Traditional outdoor bowls is played on a green in Priory Park. Other public areas such as Victoria Park in Malvern Link provide space for field sports and tennis. Malvern Town FC has a football first team that plays in the West Midlands Regional League and which has twice reached the third qualifying round of the FA Cup. The Malvern Hills are a popular launching site for hang gliding and paragliding and Malvern has a local hang gliding club. Cricket is provided for at Barnards Green Cricket Club, a professional class ground. In addition to those born in Malvern, notable people came to the town to be cured (mentioned above), to be educated or teach at the many independent schools: see articles on Malvern College, Malvern St James, the merger of St. James School and Malvern College for Girls, and Malvern College Prep. (The Downs), or to work at TRE, RRDE, their merger RRE and its successor organisations leading (as of 2011) to QinetiQ, The Hills have inspired poets and novelists. Thomas Attwood, British economist and campaigner for electoral reform, died in Malvern, on 9 March 1859. William Algernon Churchill (1865–1947) British diplomat and art historian retired to Worlfield House, Malvern in early 1920s. Nigel Coates, architect and Emeritus professor of the Royal College of Arts grew up in Malvern and was educated at Hanley Castle Grammar School. Anne, Charles Darwin's daughter, is buried in the graveyard of Malvern Priory. David Davis (1908–1996) BBC radio executive and broadcaster, was born and raised in Malvern. Evan Davis, economist, journalist and television presenter, was born in Malvern and grew up in Ashtead, Surrey. Anne Diamond, television journalist and presenter, grew up in Malvern. Stephen Duffy and his folk pop group The Lilac Time were resident in the Malverns in the late 1980s, renting a house in West Malvern in which to write and rehearse the group's first albums. His songs of that era reference Madresfield Court, the lanes of West Malvern, the locality of Cowleigh Park and renowned Upper Colwall tea rooms The Kettle Sings (1928– ). Edward Elgar, composer, taught in Great Malvern. Elgar is buried at St. Wulstan's, Little Malvern. Basil Foster (1882–1959), English cricketer who played 34 first-class matches in the early 20th century, was born in Malvern. Julius Harrison (1885–1963), was a contemporary of Elgar, and Professor of Composition at the Royal Academy of Music. He was music director at Malvern College and director of the early Elgar Festivals in Malvern. He lived in Pickersleigh Road from most of the 1940s. Charles Hastings, founder of the British Medical Association, spent his final years at Hastings House, Barnards Green. Graeme Hick, cricketer, currently resides in the Malvern area, and coaches at Malvern College. Elsie Howey, suffragette, lived most of her life and died in Malvern. Nigel Kennedy, violinist and composer, and his Polish wife Agnieszka, have a home in Malvern. William Langland's allegorical narrative poem Piers Plowman (written c.1360–1387) begins on the Malvern Hills. C. S. Lewis, novelist, was a pupil at the preparatory school Cherbourg House and Malvern College. He boarded at these two establishments between early 1911 and June 1914. Jenny Lind, opera singer, lived and died in Malvern, and is buried in Great Malvern cemetery. Cher Lloyd, singer, songwriter, and model. Caroline Lucas, British politician, and Co-Leader of the Green Party of England and Wales, was born and raised in Malvern. Ellen Marriage, Balzac translator, died in Malvern in 1946. David Mitchell, author whose works include Cloud Atlas (also a 2012 Hollywood movie) and Black Swan Green, the latter taking place in Malvern. Mitchel was educated at Hanley Castle Grammar School. Malcolm Nokes MC, (1897–1986), teacher, soldier, Olympic medallist, nuclear scientist and CENTO official. Charles William Dyson Perrins, (1864–1958), art collector, philanthropist and local government office holder. Charles Ranken, chess champion, lived in Malvern from 1871 until his death in 1905. Franklin D. Roosevelt, later President of the USA, stayed at the Aldwyn Tower Hotel while convalescing from an illness at the age of 7. George Sayer, biographer of C. S. Lewis. Haile Selassie, emperor of Ethiopia, visited Malvern during his 1936–1941 exile, staying at the Abbey Hotel and attending the Holy Trinity Church. Jacqui Smith, former British Home Secretary, was born and raised in Malvern. Philip Woodward (born 1919), a British mathematician, who worked on radar and related topics at the government TRE/RRE laboratory in Malvern for forty years, and also made major contributions to horology. ^ "About Malvern". Malvern Town Council. Archived from the original on 2 May 2009. Retrieved 5 January 2010. ^ a b Sillitoe (14 April 2008). "Detect browser settings". UK Government. Retrieved 14 April 2017. ^ "What is a town, parish or community council?". National Association of Local Councils. Archived from the original on 26 September 2011. Retrieved 26 December 2009. ^ "District Centres". Malvern Hills District Council. Archived from the original on 26 January 2010. Retrieved 5 January 2010. ^ a b c d Nott, James (1885). Some of the Antiquities of Moche Malvern (Great Malvern). Malvern: John Thompson. Retrieved 6 January 2010. ^ a b Dugdale, Sir William (1693). Monasticon Anglicanum or The History of the Ancient Abbies, and other Monasteries, Hospitals, Cathedral and Collegiate Churches, in England and Wales. With Divers French, Irish, and Scotch Monasteries Formerly relating to England (Translated from the Latin). London: Sam Keble and Hen Rhodes. p. 234. Retrieved 3 January 2010. ^ a b c d e f g h i j k l m n o Hembry, Phylis May (Deceased); Cowie, Leonard W; Cowie, Evelyn E (Completing editors) (1997). British spas from 1815 to the present. Madison, N.J: Fairleigh Dickinson University Press. ISBN 978-0-8386-3748-7. ^ a b "Key Statistics". Malvern hills District Council. 24 September 2009. Archived from the original on 23 December 2012. Retrieved 10 January 2010. ^ a b "About Malvern Town Council". Malvern Town Council. Archived from the original on 2 May 2009. Retrieved 5 August 2009. ^ Smart, Mike (2009). Malvern Hills. Frances Lincoln Ltd. p. 15. ISBN 978-0-7112-2915-0. ^ a b c d e f Page, William; Willis-Bund, J. W., eds. (1924). Victoria County History, Worcestershire. 4. London, UK. pp. 123–134. ^ a b c d e f g h i j k l Smith, Brian S. (1978) . A History of Malvern. Leicester, UK: Leicester University Press. ISBN 978-0-904387-31-5. ^ BBC (June 2003). "Malvern Hills – British Camp". BBC Hereford & Worcester. Retrieved 4 August 2009. ^ Hencken, T. (1938). "The Excavation of the Iron Age Camp on Bredon Hill, Gloucestershire 1935–1937". Archaeological Journal. Heritage Marketing and Publications. 95. ^ Bowden, Mark (2005). Field, David; Winton, Helen (eds.). The Malvern Hills: An Archaeological Landscape. English Heritage. ISBN 978-1-873592-82-3. ^ Great Domesday Book. William the Conqueror. 1086. pp. folio 173r. ^ Remfry, Paul (1998). The Herefordshire Beacon of King Harold II and the Earls of Hereford and Worcester. ukprint.com. ISBN 978-1-899376-32-2. ^ Remfry, Paul (20 February 2008). "The history of British Camp". BBC Hereford & Worcester. Retrieved 29 December 2009. Note: The BBC website contains some errors regarding the spelling of Remfry's name and ISBN for a book. See Paul Remfry's website for correct details of all his works. ^ a b c Dolan, John Gilbert (1910). Malvern in the Catholic Encyclopedia. Robert Appleton Company. Retrieved 9 July 2009. ^ a b c Grindrod, Charles, F (1899). Malvern: what to see and where to go. Thompson. ^ Historic England. "St Michaels's Chapel (113665)". PastScape. Retrieved 27 May 2012. ^ Weaver, Cora; Osborne, Bruce (2006). The Illumination of St. Werstan the Martyr. Cora Weaver. ISBN 978-1-873809-67-9. ^ "Drawing by M. T. Stevens in James Nott, Malvern Priory Church, c. 1900". University of Leicester. Retrieved 18 December 2009. ^ a b c Brooks, Alan; Pevsner, Nikolaus (23 July 2007). Worcestershire: The Buildings of England. New Haven and London: Yale University Press. ISBN 978-0-300-11298-6. ^ Worcestershire Record Office, 899.601 BA 9155. ^ Scott, Gilderdale, Heather (2005). "Lay figures in sacred spaces: the 15th-century 'donor figures' at Great Malvern Priory, Worcestershire". The Journal of Stained Glass. British Society of Master Glass Painters. 29: 12–23. Archived from the original on 30 June 2016. Retrieved 8 January 2012. ^ a b c Bradley, I (January 2011). "Bottled Up". History Today. 61 (1): 6–7. ^ "Malvern Hills Act 1884" (PDF). Malvern Hills Conservators. Archived from the original (PDF) on 21 March 2012. Retrieved 8 January 2012. ^ "Richard Banister". Oxford Dictionary of National Biography. 2004. doi:10.1093/ref:odnb/1283. Retrieved 12 January 2012. ^ "Malvern Hills – the water cure". BBC Hereford and Worcester. Retrieved 26 July 2012. ^ Banister, Richard; Guillemeau, Jacques; Hunton, Anthony (1622). A treatise of one hundred and thirteene diseases of the eyes, and eye liddes. London: Imprinted by Felix Kyngston, for Thomas Man. ^ Wall, John (1763). Experiments, and Observations on the Malvern Waters the Third Edition, Enlarged with an Additional Appendix, Containing Several Remarkable Histories. Worcester: R Lewis. ^ a b McMenemy, W.H. (January 1953). "The Water Doctors of Malvern, With Special Mention to the Years 1842 to 1872". Section of the History of Medicine. Proceedings of the Royal Society of Medicine. 46. pp. sectional pages: 1–8 (Vol pp.5–12). PMC 1918458. PMID 13027285. . Wall cited sectional p.1 (Vol. p.5). ^ Culbertson, C.G. (1978). "In memoriam. William H. McMenemy, M.D". American Journal of Clinical Pathology. 70 (1): 112.2–112. doi:10.1093/ajcp/70.1.112a. PMID 358823. ^ Surgeon, W.Addison (July – September 1828). "A Dissertation on the Nature and Properties of the Malvern Water, and an Enquiry into the Causes and Treatment of Scrofulous Diseases and Consumption, together with some remarks upon the Influence of the Terrestrial Radiation of Caloric upon local salubrity". Quarterly Journal of Science, Literature and Art, Royal Institution of Great Britain. Henry Colburn. 26: 123. ^ "Correspondence of James McNeill Whistler, footnote 27 Gully bath house". University of Glasgow. Retrieved 26 January 2012. ^ "Royal Historical Society". Royal Historical Society. Retrieved 9 July 2009. ^ "Charles Darwin, Recollections of the development of my mind and character". darwin-online.org.uk. Darwin Online. Retrieved 26 July 2012. ^ Slater, Michael (2009). Charles Dickens: A life defined by writing. Yale University Press. p. 325. ISBN 978-0-300-11207-8. ^ Ashton, Rosemary (April 2011). "Oh so quietly: the death of John Dickens". Times Literary Supplement. News International (5635): 15. ^ Mitchell, Leslie, George (2003). Bulwer Lytton: the rise and fall of a Victorian man of letters. New York: Hambledon and London. p. 92. ISBN 978-1-85285-423-2. ^ McDermot, Terence, Edward; Clinker, C.R. ; Nock, Stevens, Oswald (1964). History of the Great Western Railway, Volume 1. Ian Allan Ltd.
^ Baedeker, Karl (1887). Great Britain: England, Wales and Scotland. London: Dulau and Co.
^ "Warwick, Earl of (GB, 1759)". Cracroft's Peerage. Archived from the original on 22 April 2012. Retrieved 12 January 2012. ^ Cooke, Kinloch, Clement (1909). A memoir of Her Royal Highness Princess Mary Adelaide, Duchess of Teck, Vol 2. London: John Murray. p. 234. ^ "The Malvern Register 1865–1904". www.archive.org. Retrieved 26 July 2012. ^ Burne-Jones, Georgiana (1904). Memorials of Edward Burne-Jones. London: MacMillan. ^ Roosevelt, D, Franklin; Roosevelt, Elliott (1947–1950). F.D.R., His Personal Letters. New York: Duell, Sloan, and Pearce. ^ Young, D. J. (1991). The Story of the Malvern Council House. Malvern: First Paige. p. 12. ^ "Parish Councils". Malvern District Council. Retrieved 23 May 2009. ^ Hill, Don; Jones, Eric; Lomas, Janet; Mayner, Peter; McCulloch, Rosemary; Skinner, Michael (August 2005). The Guarlford Story. Malvern, UK: Guarlford History Group. p. 158. ISBN 978-0-9550498-0-4. ^ "Ward map". Malvern Town Council. Archived from the original on 2 May 2009. Retrieved 4 August 2009. ^ "August 1990". Retrieved 22 February 2011. ^ ">25c days". Retrieved 22 February 2011. ^ ">Annual average hottest day". Retrieved 22 February 2011. ^ "December 2010 Minimum". Retrieved 22 February 2011. ^ "December 1981 Minimum". Retrieved 22 February 2011. ^ "January 1982 Minimum". Retrieved 22 February 2011. ^ Mayes, Julian (2004). "Weather news Sunshine". Weather. 59 (3): 58. Bibcode:2004Wthr...59...58M. doi:10.1256/wea.34.04. ^ "1971–00 Rainfall". Retrieved 22 February 2011. ^ "1971–00 Raindays". Retrieved 22 February 2011. ^ "Climate Normals 1971–2000". KNMI. Retrieved 22 February 2011. ^ "ONS ward map showing North Malvern & West Malvern grouped together". Office for National Statistics. Retrieved 14 July 2009. ^ "Parish Headcounts". Office for National Statistics. 2001. Retrieved 14 July 2009. ^ "Malvern Civil Parish head count". Office for National Statistics. Retrieved 8 July 2009. ^ a b "Malvern Civil Parish work and qualifications". Office for National Statistics. Retrieved 8 July 2009. ^ a b "Malvern Hills Local Authority key statistics". Office for National Statistics. Retrieved 8 July 2009. ^ "Malvern Civil Parish people". Office for National Statistics. Retrieved 8 July 2009. ^ Price, Robin (1981). "Hydropathy in England 1840–70". Medical History. 25 (3): 269–280. doi:10.1017/s002572730003458x. PMC 1139039. PMID 7022064. ^ a b Penley, Bill (13 November 2009). "TRE History". Penley Radar Archives. Retrieved 3 January 2010. ^ "Key Statistics". Malvern Hills District Council. Archived from the original on 23 December 2012. Retrieved 6 January 2010. ^ Hale, Robert (18 September 2014). "Hundreds of new homes proposed for Malvern Hills in latest version of South Worcestershire Development Plan". Malvern Gazette. Newsquest (Midlands South) Ltd. Retrieved 13 April 2018. ^ "Neighbourhood statistics: Malvern CP (Parish)". Office for National Statistics. 2001. Retrieved 5 January 2009. ^ "Purbeck Radar ~ Worth Matravers". Purbeck Radar Museum Trust. Retrieved 11 January 2012. ^ R.A., Smith (10 April 1956). "Physics at the Radar Research Establishment, Malvern". Proceedings of the Royal Society of London. Series A, Mathematical and Physical Sciences 235: 1–10. ^ Putley, Ernest. Science comes to Malvern, TRE a Story of Radar 1942 to 1953. ^ "Malvern Hills Science Park". Malvern Hills District Council. Archived from the original on 26 January 2010. Retrieved 13 July 2012. ^ "Minister visits science park". Malvern Gazette. Newsquest Media Group. 17 March 2009. Retrieved 13 July 2012. ^ Webb, Martyn (26 September 2008). Morgan, Malvern and Motoring. The Crowood Press Ltd. ISBN 978-1-84797-039-8. ^ "Morgan History". Morgan Motor Company. Archived from the original on 24 May 2009. Retrieved 19 May 2009. ^ "Chance Brothers History". Chance Glass Ltd. Retrieved 11 January 2010. ^ "Nicholson: portfolio". Nicholson & Co Ltd. Archived from the original on 8 April 2011. Retrieved 8 January 2010. ^ "Three Counties Agricultural Society, UK registered charity No. 511868". Charity Commission. Retrieved 5 January 2010. ^ a b "Three Counties Show – history". BBC Hereford and Worcester. 18 June 2009. Retrieved 2 January 2010. ^ "RHS Spring Gardening Shows". Royal Horticultural Society. Archived from the original on 6 July 2009. Retrieved 30 June 2009. ^ a b Elliott, Brent (1997). "Victoria Medal of Honour 1897 – 1997". The Garden. London: The Royal Horticultural Society. 122. ^ a b Smith, Keith (1989). Around Malvern in old photographs. Gloucester: Alan Sutton Publishing. ISBN 978-0-86299-587-4. ^ Price, Philip; Palmer-Price, Julia. "The Grove, Malvern". Philip Price & Julia Palmer-Price. Archived from the original on 26 March 2012. Retrieved 3 January 2010. ^ "Whitbourne Hall". Whitbourne Hall. Retrieved 3 January 2010. ^ Walker, Kenneth M. (7 September 1999). "Imperial Hotel, Avenue Road". Images of England. Retrieved 8 July 2009. ^ Adams, Byron (2007). Edward Elgar and His World. Princeton University Press. p. 26. ISBN 978-0-691-13446-8. ^ "Malvern Wells and Wyche". The Church of England, Archbishops' Council. 2010. Archived from the original on 5 October 2012. Retrieved 1 August 2011. ^ "The Elgar Route". BBC Hereford and Worcester. 13 March 2008. Retrieved 16 December 2009. ^ "Malvern Concert Club". Malvern Concert Club. Archived from the original on 28 March 2012. Retrieved 1 January 2012. ^ "Autumn in Malvern Festival". Malvern Festival. Retrieved 2 January 2010. ^ Hickling, Alfred (28 September 2006). "Alfred Hickling talks to Nigel Kennedy". London: The Guardian. Retrieved 7 July 2011. ^ "An Evening with Nigel Kennedy". Malvern Theatres. 6 December 2017. Retrieved 12 April 2018. ^ a b "Worcestershire's other composer". This is Worcestershire. 14 April 2001. Archived from the original on 4 July 2007. Retrieved 12 July 2009. ^ "Great gigs at The Winter Gardens". BBC News. 24 November 2009. Retrieved 16 April 2012. ^ "Tales of Hendrix, The Beatles, Robert Plant, and more". BBC News. 2 February 2010. Retrieved 16 April 2012. ^ a b "Malvern Theatres". Malvern Theatres. Retrieved 16 December 2009. ^ a b c "History of Malvern Theatres (1884–1977)". Malvern Theatres. Archived from the original on 28 March 2012. Retrieved 3 January 2010. ^ Shaw, Bernard; Jackson, Barry, Vincent; Conolly, Leonard, W. (2002). Bernard Shaw and Barry Jackson. University of Toronto Press. p. 98. ISBN 978-0-8020-3572-1. ^ "Centenary celebration". Malvern Gazette. Newsquest. 2 June 2006. Retrieved 10 January 2012. ^ Neale, Dennis (22 July 2009). "The Theatre of Small Convenience". The Theatre of Small Convenience. Retrieved 8 January 2010. ^ Skeat, W. W. (1886). Langland, Piers the Plowman. Oxford, UK: Clarendon Press. ISBN 978-1-4370-1999-5. ^ Drayton, Michael (1876). The Complete Works of Michael Drayton. London: J. R. Smith. ^ Gerrard, Christine; Fairer, David (2004). Eighteenth-Century Poetry: An Annotated Anthology 2nd ed. Oxford: Blackwell. pp. 239–59. ^ Wilmott, Aris, Robert (1853). The Poetical Works of Thomas Gray, Thomas Parnell, William Collins, Matthew Green, And Thomas Warton. London: Routledge & Sons. p. 112. ^ The Cambridge History of English and American Literature in 18 Volumes (1907–21), Volume X. The Age of Johnson. VI. Gray.§ 18. Gray's death. Cambridge: University Press. 1907–21. ^ Cottle, Joseph (1829). Malvern Hills, with minor poems, and essays. London: T. Cadell. ^ Wordsworth, William (1837). The poetical works of William Wordsworth. London: Edward Moxon. ^ Brewer, E. Cobham (1898). Dictionary of Phrase and Fable. Philadelphia: Henry Altemus. ^ Eliot, Charles, W., ed. (1909–14). English poetry II: from Collins to Fitzgerald. Vol. XLI. The Harvard Classics. New York: P.F. Collier & Son. ^ "Malvern – the Narnia connection". BBC Hereford and Worcester. 21 October 2009. Retrieved 23 February 2011. ^ a b Griffiths, Alan; Griffiths, Joyce B. (2001). Great Malvern – a photographic history of your town. Salisbury: Black Horse Books. p. 42. ISBN 978-1-904033-52-3. ^ Duriez, Colin (July 1992). The J.R.R. Tolkien handbook: a comprehensive guide to his life, writings, and world of Middle-earth. Grand Rapids, MI: Baker Book House. p. 253. ISBN 978-0-8010-3014-7. ^ a b Sayer, George (1979) [based on an August 1952 recording]. J.R.R. Tolkien Reads and Sings his the Hobbit and the Fellowship of the Rings (Liner). J.R.R. Tolkien. Caedmon Records. ^ Carpenter, Humphrey (1977). J. R. R. Tolkien: A Biography. New York: Ballantine Books. ISBN 978-0-04-928037-3. ^ a b Carpenter, Humphrey (1981). W. H. Auden: A Biography. London: George Allen & Unwin. ISBN 978-0-04-928044-1. ^ Davenport-Hines, Richard (1995). Auden. London: Heinemann. ISBN 978-0-434-17507-9. ^ Young, Francis Brett. "Mr Lucton's Freedom". Bookwormers. Archived from the original on 5 April 2012. Retrieved 4 December 2011. ^ Young, Francis Brett (1941) . Mr Lucton's Freedom (Hardcover). The Book Club. ASIN B000J37CSQ. OCLC 5160637. ^ "Malvern's water". malvern-hills.co.uk. Archived from the original on 16 May 2011. Retrieved 16 February 2011. ^ Herrman, Luke (1973). British Landscape Paintings of the Eighteenth Century. London, UK: Faber & Faber. p. 173. ISBN 978-0-571-09394-6. ^ Hamilton, Jean; Lambourne, Lionel (1980). British Watercolours in the Victoria and Albert Museum. Sotheby Parke Bernet. p. 295. ISBN 978-0-85667-111-1. ^ "Paintings are a love letter to the hills". Worcester News. 4 July 2011. Archived from the original on 14 January 2013. Retrieved 16 April 2012. ^ "Buzzards soar over Malvern". Malvern Gazette. Newsquest Media Group. 23 November 2012. Retrieved 26 November 2012. ^ "Young Ken Russell comes to make Elgar film". Malvern Gazette. Newsquest Media Group. 31 August 2012. Retrieved 10 December 2012. ^ Rolinson, Dave (2005). Alan Clarke. Manchester University Press. ISBN 978-0-7190-6830-0. ^ Rabey, David (1998). David Rudkin: Sacred Disobedience: an expository study of his drama 1959–96. Routledge. ISBN 978-90-5702-126-8. ^ "Tank Quarry". www.doctorwholocations.net. Dr Who – The Locations Guide. Retrieved 3 November 2011. ^ "West of England Quarry". www.doctorwholocations.net. Dr Who – The Locations Guide. Retrieved 3 November 2011. ^ "Doctor Who (Classic Series) The Krotons". BBC Worldwide. Retrieved 3 November 2011. ^ "The Malvern Spa Association". malvern-hills.co.uk. Archived from the original on 29 April 2009. Retrieved 7 July 2011. ^ Parliamentary Debates (Hansard). 37. House of Commons. 15 February 1983. col. 268–274. ^ "Taking the waters in Malvern". BBC Hereford & Worcester. June 2003. Retrieved 10 July 2011. ^ "Malvern". The Coca-Cola Company. Archived from the original on 17 December 2009. Retrieved 2 January 2010. ^ All, Malvern for. "Malvern's Twin Town – Malvern for All". Retrieved 14 April 2017. ^ "Malvern officially twinned with French spa town Bagnères-de Bigorre". Retrieved 14 April 2017. ^ "117 valid peals for Malvern Link, S Matthias, Worcestershire, England". Felstead Pealbase. Retrieved 8 July 2009. ^ "Malvern Hospital gets Royal Approval". Capita Symonds. 11 March 2011. Retrieved 21 June 2011. ^ "Future of Malvern's old community hospital to be decided tonight". Malvern Observer. ^ "GP practices in Malvern". Neighbourhood Professionals. Retrieved 3 January 2010. ^ "Whiteacres Medical Centre". Whiteacres Medical Centre. Retrieved 18 July 2009. ^ "Ambulance lands a new base – on the M5". Birmingham Evening Mail. Trinity Mirror Midlands Limited. 6 May 1998. ^ "West Midlands Ambulance Service". Archived from the original on 30 June 2007. Retrieved 9 December 2012. ^ "Local Bus Services in the Malvern Hills Area" (PDF). Worcestershire County Council. Retrieved 12 April 2018. ^ "Great Malvern". Journey Solutions partnership. Archived from the original on 13 April 2018. Retrieved 12 April 2018. ^ "Malvern bus routes map". Worcestershire County Council. Archived from the original on 5 April 2010. Retrieved 29 July 2012. ^ "Gloucestershire Airport". Gloucestershire Airport Limited. Retrieved 2 January 2010. ^ "Taxis in Great Malvern". BritInfo.net. Retrieved 9 December 2012. ^ a b Holt, Gill (2002). Malvern Voices – Schools. Malvern Museum. p. TOC. ISBN 978-0-9541520-2-4. ^ Holt, Gill (2002). Malvern Voices – Schools. Malvern Museum. pp. 32, 73. ISBN 978-0-9541520-2-4. ^ Holt, Gill (2002). Malvern Voices – Schools. Malvern Museum. pp. 1, 2. ISBN 978-0-9541520-2-4. ^ a b "Malvern St James". Malvern St James. Retrieved 3 January 2010. ^ "Malvern College". Malvern College. Archived from the original on 14 April 2012. Retrieved 3 January 2010. ^ "James Meade, economist, 1977 winner of the Nobel Prize in Economics". The Library of Economics and Liberty. Retrieved 12 January 2010. ^ "Francis William Aston, Physicist, 1922 winner of the Nobel Prize in Chemistry". The Nobel Foundation. Retrieved 12 January 2010. ^ "Work calls halt to chances of glory in Stockholm Olympics". The Northern Echo. Newsquest Media Group. 3 October 2000. Retrieved 12 January 2010. ^ "Hatley St George and the families that lived there". Angus and Rosemary's Miscellany of Malvern - Local History. ^ "South Worcestershire College". South Worcestershire College. Retrieved 2 January 2010. ^ "Malvern U3A". Malvern U3A. Archived from the original on 5 June 2012. Retrieved 12 January 2012. ^ "The Winter Gardens, Malvern". BBC Hereford & Worcester. Retrieved 3 January 2010. ^ "The Worcestershire Way". Archived from the original on 16 July 2012. Retrieved 26 July 2012. ^ "Manor Park Club website". Retrieved 10 October 2010. ^ "Henman delight at Malvern plan". Worcester News. 7 November 2010. Retrieved 26 April 2012. ^ "Malvern Hang Gliding Club". Malvern Hang Gliding Club. Retrieved 20 May 2009. ^ Putley, Ernest H. (1985). "The history of the RSRE". Physics in Technology. Institute of Physics. 16: 5–18. Bibcode:1985PhTec..16...13P. doi:10.1088/0305-4624/16/1/401. ^ Moss, David, J. (1990). Thomas Attwood, the biography of a radical. Montreal: McGill Queens University Press. ISBN 978-0-7735-0708-1. ^ "Still playing the rebel: Nigel Kennedy is back and he's showing no signs of mellowing". The Independent. 4 September 2009. Retrieved 17 February 2011. ^ "Chronology of the Life of C.S. Lewis". C. S. Lewis Foundation. Archived from the original on 6 February 2012. Retrieved 10 October 2010. ^ Barns, Sarah (26 January 2018). "X-TREME JOURNEY How Cher Lloyd went from X Factor hopeful to unlikely US pop smash and now baby mama – and she's only 24". The Sun. News Group Newspapers Limited. Retrieved 12 April 2018. ^ David Rogers (2004). "Perrins, (Charles William) Dyson". Oxford Dictionary of National Biography. doi:10.1093/ref:odnb/35485. ^ Harry Golombek, Golombek's Chess Encyclopedia, 1977, p. 271. ISBN 0-517-53146-1. ^ "Worcestershire Beacon, Malvern Hills". BBC. 2009. Retrieved 16 February 2011. ^ "Haile Selassie". BBC West Midlands. January 2005. Retrieved 12 July 2009. ^ "News and Publications – News Release". Royal Academy of Engineering. Retrieved 6 July 2009. ^ Woodward, Philip (2006). Woodward on Time: A Compilation of Philip Woodward's Horological Writings. British Horological Institute Limited. ISBN 978-0-9509621-6-0. ^ "Retired scientist given award". Malvern Gazette. Newsquest Media Group. 7 July 2009. Retrieved 11 December 2011. Bowden, Mark; Field, David; Winton, Helen (2005). The Malvern Hills: An Ancient Landscape. English Heritage. ISBN 1-873592-82-5. Dixey, Mary; Stewart, Duseline (1996). The wonderful world of Lawnside: the history of a Malvern School c.1852–1994. Malvern: Lawnside Old Girls' Association. Freer-Minshull, Tony (2007). The Foley Family. 1. lulu.com. ISBN 1-84753-016-8. Freer-Minshull, Tony (2007). The Foley Family. 2. lulu.com. ISBN 1-84753-057-5. Garrard, Rose (2010). A Malvern Treasury. Malvern: Garrard Art Publications. ISBN 978-1-905795-56-7. Garrard, Rose (2008). Donkey's Years on the Malvern Hills. Malvern: Aspect Design. ISBN 978-1-905795-18-5. Hastings, G. W. (1911). The Story of Malvern. Cornish Brothers Ltd.
Hembry, Phyllis (1990). The English Spa 1560–1815: A Social History. London: The Athlone Press. ISBN 0-485-11374-0. Retrieved 15 July 2010. Hurle, Pamela (1989). Bygone Malvern (1 ed.). Phillimore & Co Ltd. ISBN 978-0-85033-725-9. Iles, Brian (2005). The Malverns (Images of England). The History Press Ltd. ISBN 978-0-7524-3667-8. Lloyd, David (1993). History of Worcestershire (Darwen County History). Phillimore & Co Ltd. ISBN 978-0-85033-658-0. Nott, James (2009). Some of the Antiquities of Moche Malverne, Great Malvern: Including a History of Its Ancient Church and Monastery, Engravings of Seals of the Convent (1885). Kessinger Publishing. ISBN 978-1-104-30692-2. "Malvern as described in 1911 Encyclopædia Britannica". The Encyclopædia Britannica. XVII. New York: The Encyclopædia Britannica Inc. 1910–1911. pp. 518 (535 in electronic page field). Retrieved 5 December 2009. Poulton-Smith, Anthony (2003). Worcestershire Place Names. The History Press. ISBN 0-7509-3396-8. Waite, Vincent (1968). Malvern Country. J. M. Dent & Sons. ISBN 0-85033-335-0. Worcester & The Malverns. Cassini Revised New Series Historical Map (1899–1901 Facsimile ed.). Cassini Publishing Ltd. 2007. ISBN 978-1-84736-348-0. Worcester & Great Malvern (PPR-WGM): Four Ordnance Survey Maps from Four Periods from Early 19th Century to the Present Day. Cassini Past and Present Map (Folded map ed.). Cassini Publishing Ltd. 2007. ISBN 978-1-84736-265-0. Wikivoyage has a travel guide for Malvern (England). 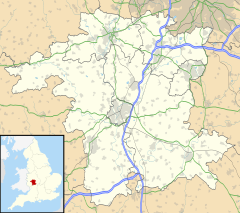 Wikimedia Commons has media related to Malvern, Worcestershire.